So there is often great confusion over what reindeer like to nom on and if you ever find yourself in that special situation where your dinner date is a reindeer we would hate for you to be unprepared! The key to any nice dinner is of course a nice accompanying beverage; reindeer love fresh water from a mountain burn or pool… or even an upland lochan – they turn up their noses at tap water so that’s a big no no, I’ve seen reindeer lap up rain droplets up instead of lowering themselves to drinking the tap water we provide them on Christmas events! Reindeer LOVE lichen… I mean L.O.V.E lichen! Although partial to a bit of tree lichen (you could add it in for flair!) the mainstay for the reindeer are ground growing lichens, they are the only animal excepting gastropods (snails/slugs) to have evolved the digestive enzyme to break down lichen. Lichen is the main source of food for reindeer in the winter when the rest of the grazing has died back for the year and forms springy carpets at the bases of heathers and sedges up on the mountains here. However, interestingly enough lichen contains barely enough nutrients and energy to sustain a gnat let alone a reindeer. Thus in the winter the reindeer very cleverly slow their metabolism right down and the young stop growing – being a reindeer is very much a feast and famine business. NB. It may be best to plan a summer dinner with your chosen reindeer. The summer diet is much more varied, it’ll make for a multi-course experience! Once spring hits, the mountains turn green and all the lush grazing once again unfurls. Reindeer will eat almost anything montane, chewy and fibrous (reindeer have adapted to live off low nutrient arctic plants) – there is a common misconception that a lovely field of grass would float their boats but in actual fact it would be the equivalent of us living off a complete diet of clotted cream and would end in some unhappy digestive systems! 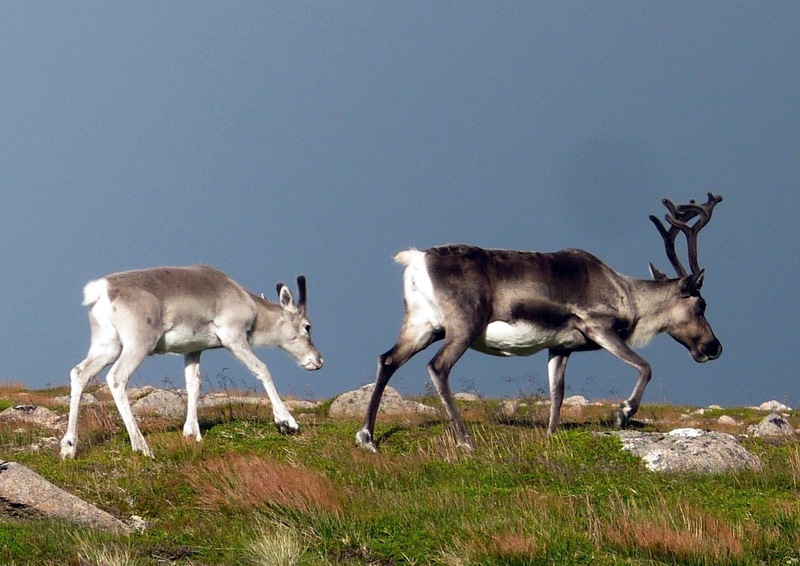 Reindeer will graze on an array of montane sedges and heathers as well as leafier vegetation such as birch and blaeberry (wild blueberry) leaves in the summer months. In the autumn reindeer will do anything for a wild mushroom; their digestive system allows them to eat even the super poisonous Fly agaric mushroom, however mushrooms often = drunk reindeer which is more than hilarious! Reindeer will also eat some rather unusual things to gain nutrients if they are lacking, such as cast antler bone (full of great minerals!) 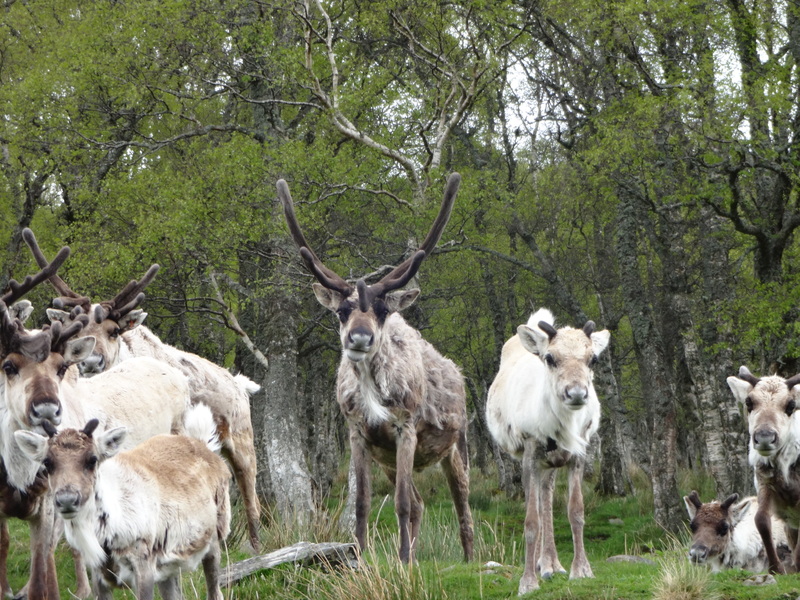 as well as the velvet skin they shed from their antlers in the late summer – yum! We have ascertained that while they will eat their own velvet, they draw the line at anyone else’s! Whilst this is the mainstay of a natural reindeer diet, if you’ve visited us here you may know we provide a supplementary feed for the reindeer for several reasons – reindeer are greedy and it ensures we have a lovely visit, we give them a wee bit of a helping hand at times of year when grazing is scarce and finally for half the year we use a 1200 acre enclosure and providing a supplement mix ensures all of our yummy natural grazing can re-grow. First things first if you’re going to make a mix for your reindeer you’ll need to acquire a cement mixer. It is the sure fire way to make a yummy and well mixed batch, your dinner won’t go well if items are poorly distributed! We like to mix with a tonne of hay-mix (chopped up hay) which is covered in garlic molasses. The garlic is great for the digestive system but it does mean us herders have a garlicy scent most of the time. It can be a very lonely existence this reindeer herding! Next a splash of barley and sugar-beet alongside a general sheep feed full of good grains and our last ingredient is rather special. It’s called dark grains and looks pretty boring BUT is by far the coolest thing in the mix. It’s a by-product of alcohol distilling (malt whisky production), obtained by drying solid residues of fermented grain to which certain solubles (pot ale syrup or evaporated spent wash) have been added. Unfortunately all the alcohol is all gone by this stage and the dark grains themselves are rather bitter so maybe mix them in well! One final word of wisdom if you want to posh up your dinner is to sneak some seaweed in there – we discovered the reindeer loved the stuff after it was used to fertilize a patch of tree saplings and they ate it all. 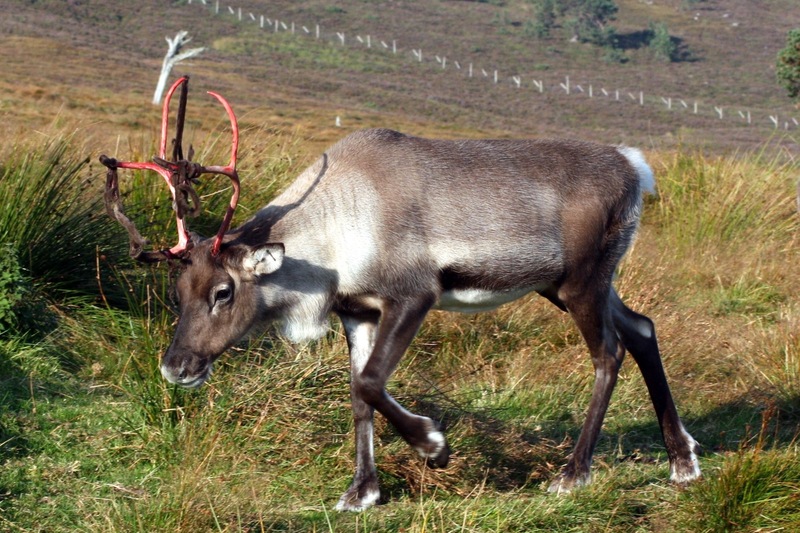 It’s now something we regularly provide for the reindeer in our paddocks and enclosure over the summer months. We wish you the best of luck and hope if you ever have a reindeer date dilemma we’ve provided some key tips to a great evening or you! Gandi and Puddock with their main course of lichen! 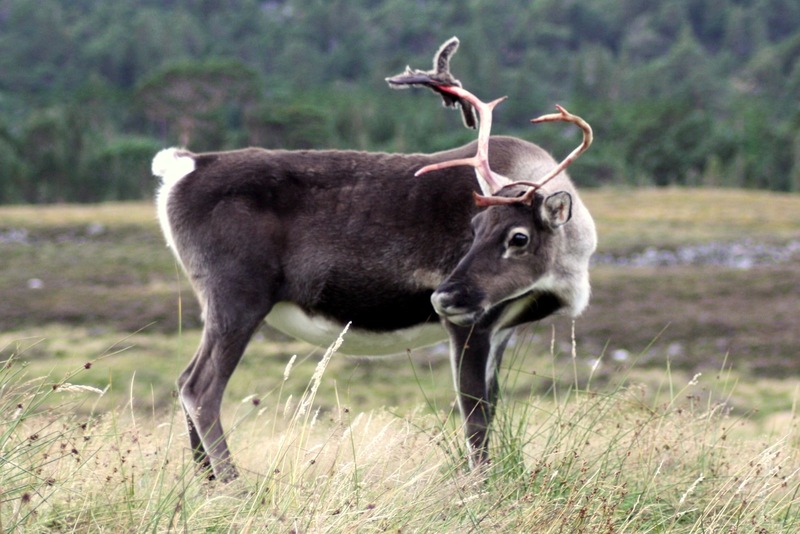 So as most, if not all of you know, Glenmore where we are based and the surrounding area is rich in wildlife, and it is always a delight to see other creatures on our walks to the reindeer, as well as the reindeer themselves. 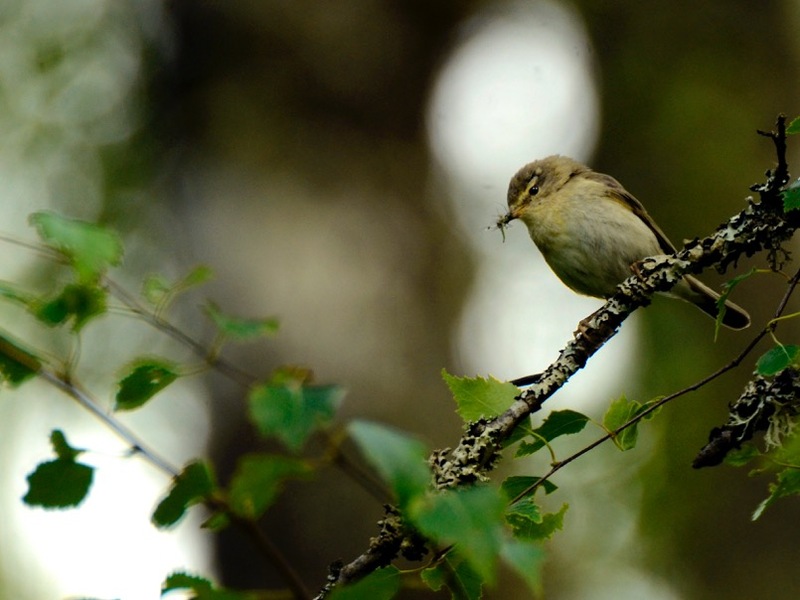 It’s been such lovely weather recently and we have seen and heard a wide array of birds and other creatures recently, so I thought you might like to know what to look and listen out for on your trip up to the reindeer in the spring and summer. The path on our walk to the reindeer is lined by trees and there are many animals and birds which call the forest home. Most often seen are chaffinches, as they seem to be less shy than other birds. To borrow a phrase from Hen, the trees are “dripping in willow warblers”, which we always hear and sound familiar to chaffinches, but are more ‘flutey’. We also cross a river on the way to the enclosure which means we see birds associated with water. Just a few weeks ago we saw a dipper on the rocks, bobbing away looking for food. We also see grey wagtails, with their yellow bums, and pied wagtails too. Very lucky visitors can also get a glimpse of our ‘tame’ roe deer. Occasionally we see her just to the side of the path, or even in the car park. She doesn’t seem too bothered by us but we always try to keep quiet if she is around. The visitors get very excited that they’ve seen a deer even before getting to the enclosure! 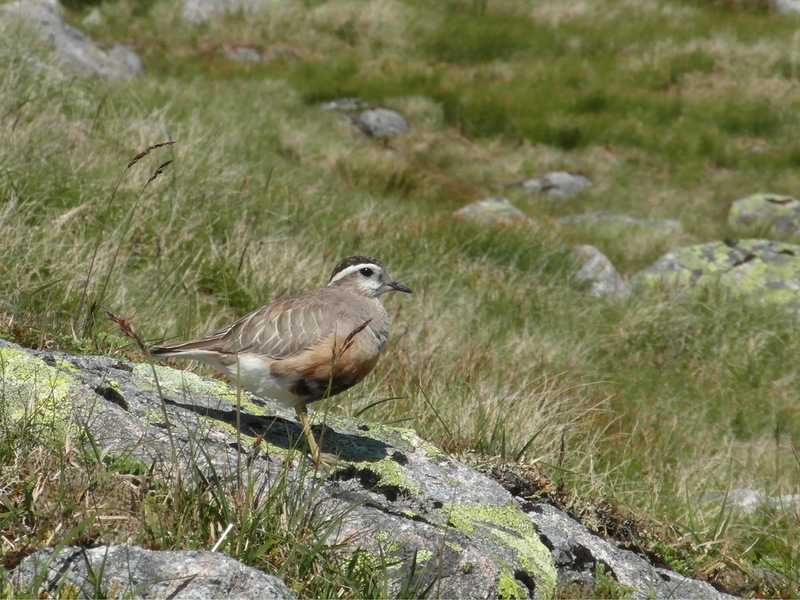 Inside the enclosure, we encounter upland birds and often see red grouse, hearing them shout ‘go-back-go-back-go-back-go-back-go-back’ at us as they fly off. There are often curlews calling to each other, wood pigeon, crows, and cuckoos in the forests. 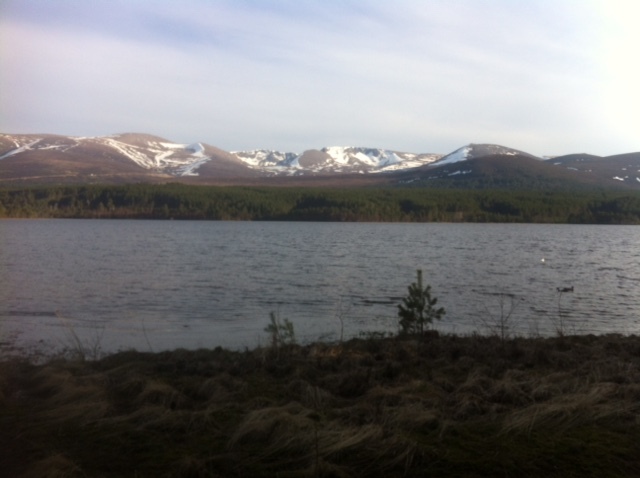 If you’ve been on the visits, you’ll know that we are also plagued by ducks from Loch Morlich! 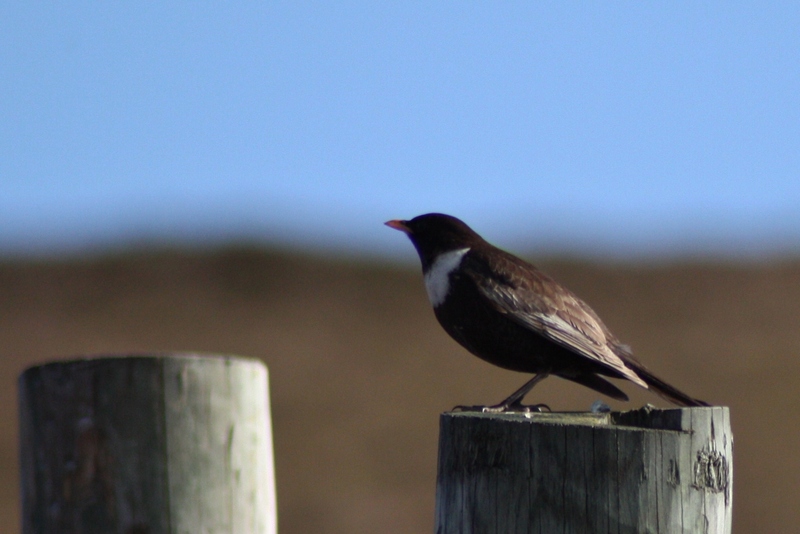 Ring ouzels, a migratory bird which breeds in the north of Scotland during summer, are often seen flying around too. They are fairly similar in size and shape to a blackbird, and look similar to them to except that they have a white collar on their chest. There are some black grouse too, but they are very shy and we only see them when we go up early in the morning. We have snipe in the enclosure, and I once almost stepped on a snipe nest when I was trekking last year! Ring ouzel on the hill enclosure fence – not the best photo! 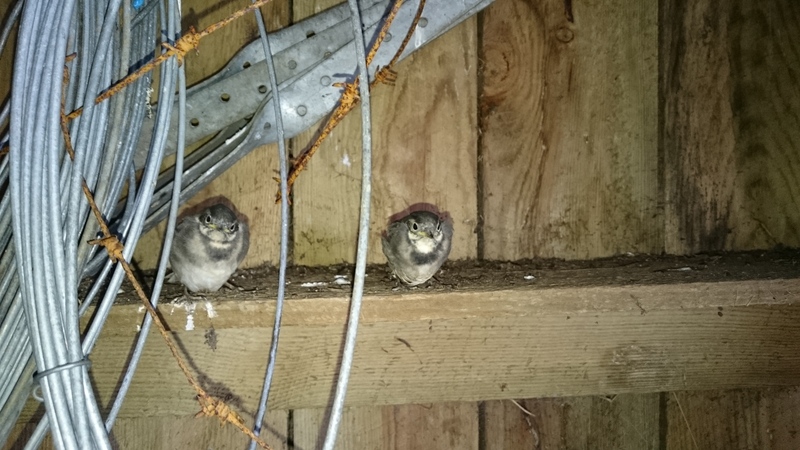 We recently had some nesting wagtails in the shed in our hill enclosure. The fledglings were so cute and fluffy! There are always a few roe deer in the enclosure and on our early morning jaunts to look for calving females we often hear them barking. We even seen red deer in the enclosure and Abby and Andi were super lucky to see an osprey flying over the enclosure. 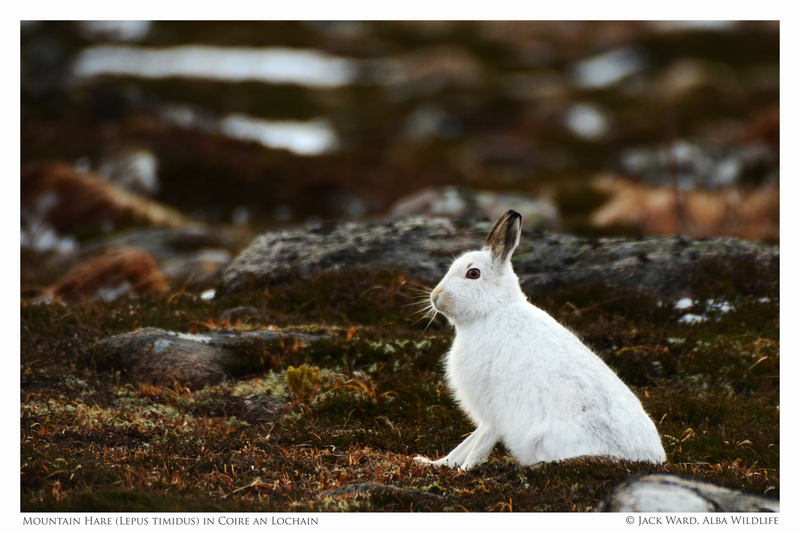 We have a few mountain hares running around and a couple of leverets always seem to be hanging around our shed area. We have toads, lizards, mice, weasels and lots and lots of midges too! And years ago Hen was walking along the boardwalk when she and a mole, of all things, passed each other – on the boardwalk! 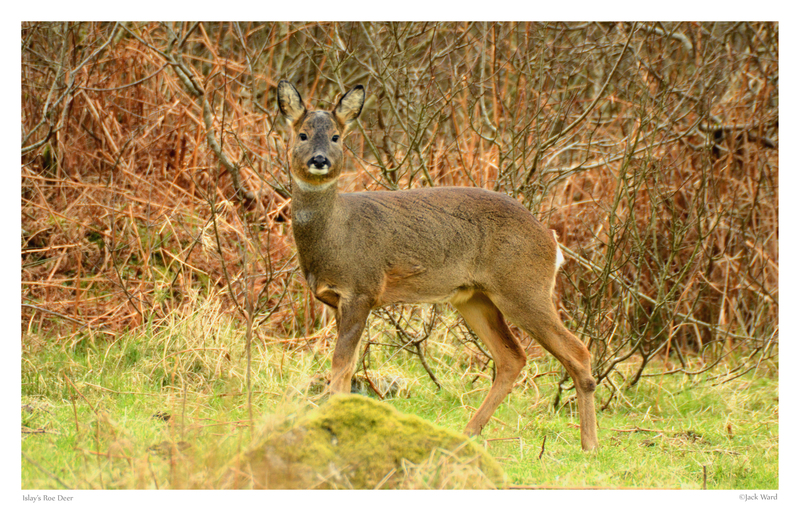 Roe Deer, again courtesy of Jack Ward. **Sidenote: Abby wanted me to call this blog “Oot and Aboot with Imogen” but I refused. This blogging business is much too serious for trivial blog titles, obviously. Summer solstice and reindeer herding! For me the summer solstice always fell on June 21st and I never knew otherwise however apparently this year it was on the 20th… Something to do with being a leap year?!? Anyway to mark the occasion it’s always quite nice to do something, whether we get a group of folk together and have a game of rounders or go for a nice ‘summery’ walk. This year we decided to take a wander up into the Northern Coire’s – Coire an Lochain in particular! Looking up from Glenmore and Loch Morlich this is the furthest right Coire with a large patch of snow on the right hand side of it. 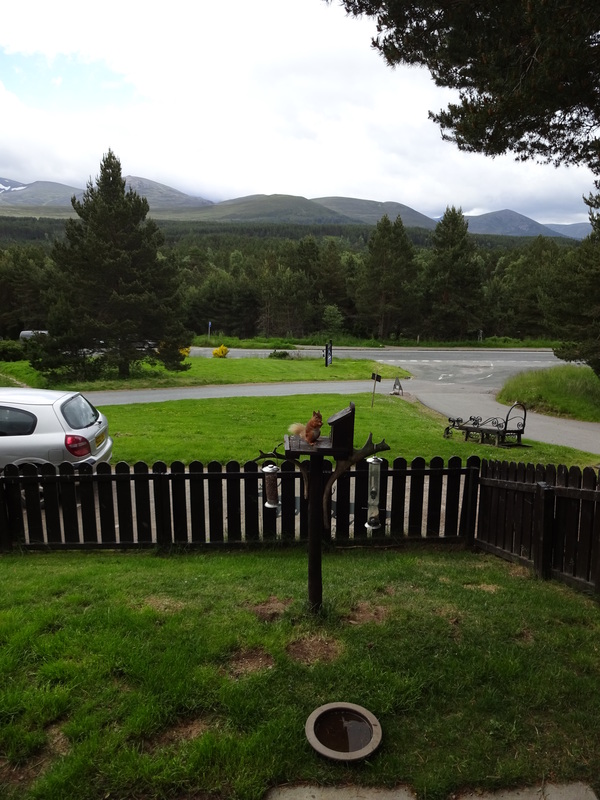 Mid-summer here always seems to be fairly awful weather, I even recall wearing my waterproof ski trousers for this about 4-5 years ago and in true Scottish Highlands style this year was no different. However, it wasn’t raining so we were already up on other years! So we set off up the path into the Coire and it took us about an hour of which we chit chatted the whole way, of course putting the world to rights! Right in the back of Coire An Lochain there is, as stated in its name, a wee loch. We arrived with bags filled with tea and cake (very important for us reindeer herders), my bagpipes and four fairly hyper dogs (3 of them being under the age of two). 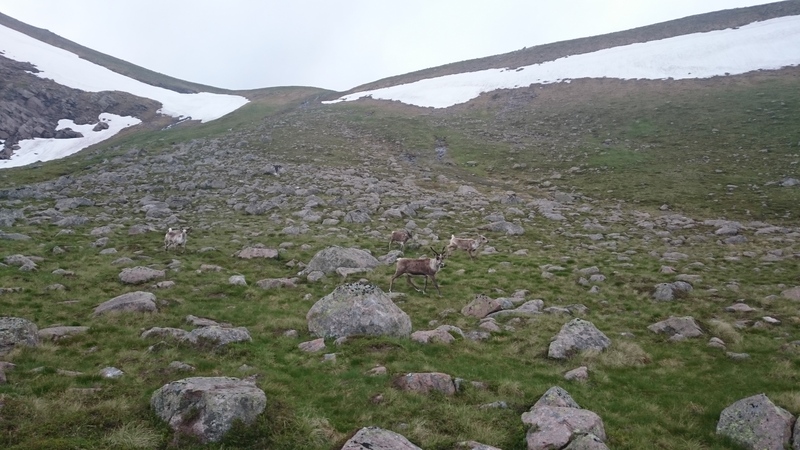 As we arrived into the Coire something caught my eye… 4 reindeer behind the loch. Straight away dogs were called in and put on a leads, just in case, and I scooted over towards them to see if I could see who it was. Malawi, one of our older females in the herd at the age of 11 now was leading them away from us and she was followed by Okapi and two younger females (who I didn’t get close enough to, to ID). A three year old and a two year old, I got that much! They obviously weren’t too keen on coming up to us as we had the dogs but they did stop in their tracks when I started calling them, it was just unfortunate I didn’t any food as a bit of bribery to come a bit closer, then I would have definitely worked out the other two. Malawi is easy to identify because she has never grown any antlers which is pretty unusual. Like I said the reindeer didn’t hang around as they don’t like dogs so we got onto what was also very important after our walk in – tea, cake and a quick blast on the bagpipes. 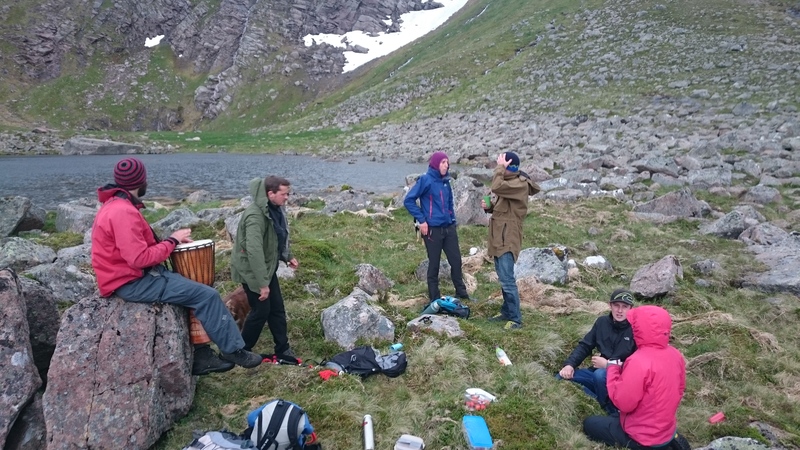 I’m not really in practice at the moment so any wee slip up with notes I blamed on the cold weather and my fingers weren’t working properly but they sounded pretty awesome in the Coire getting good acoustics bouncing off the head wall. At this time of year it is light until about midnight and light again in the morning round 3.30am. Such a lovely time of year which is why we try to make the most of it by being outside. It’s a bit different in the winter months when it isn’t light until 9am and dark by 3.30pm but it’s also nice to have that comparison throughout the year too. Of course in the far north and Scandinavia they have the midnight sun… I shall have to go and see that one year for sure! 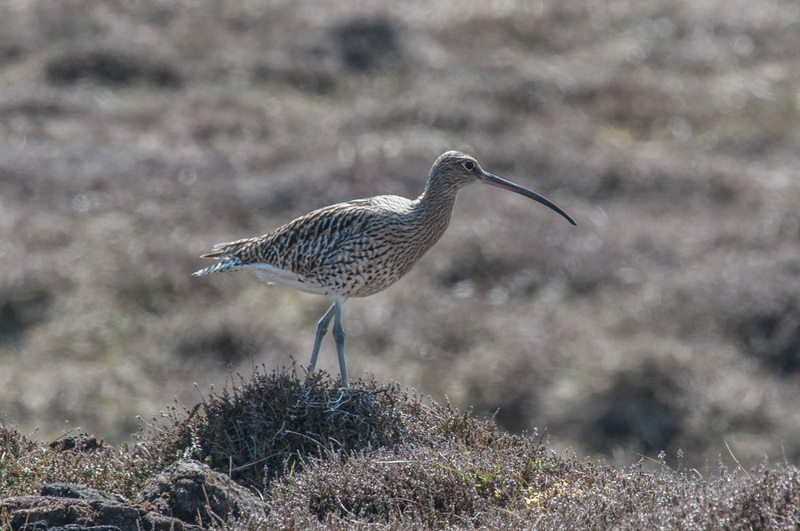 Spring and early summer is a wonderful time here at Glenlivet because the farm comes alive with very noisy breeding birds, in particular waders like Curlew, Oyster catchers and Lapwings. 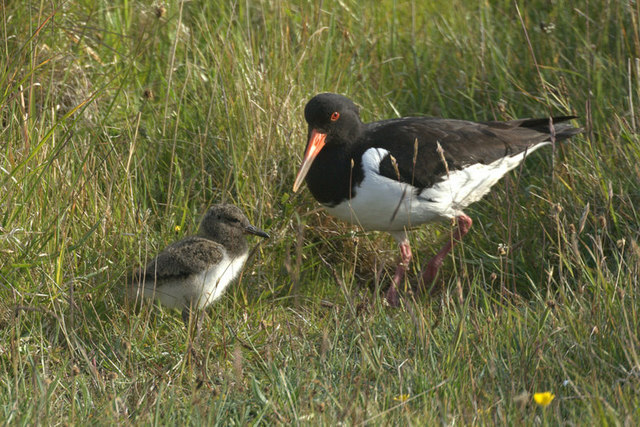 Oystercatcher and chick © Mike Pennington and licensed for reuse under this Creative Commons Licence. All three species are ground nesting so vulnerable to disturbance, intensive farming and predation. 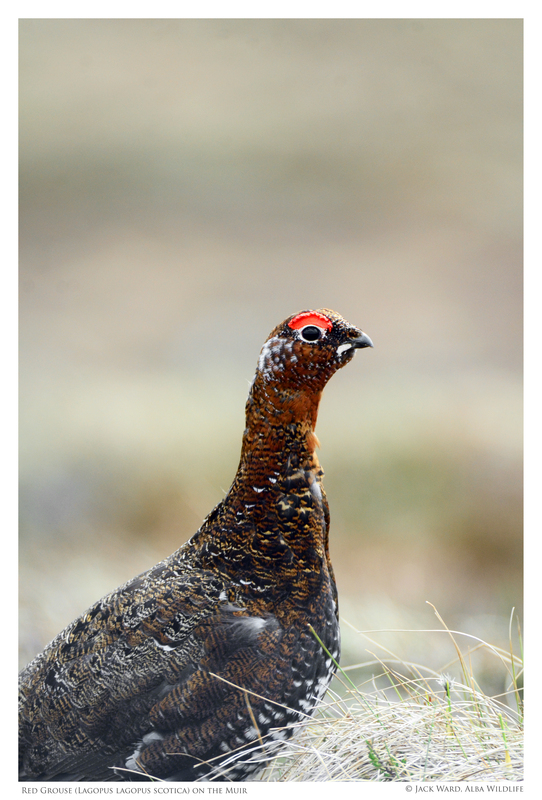 Because of the remote nature of Glenlivet area, the traditional way farming is practiced and the fact that it is an active sporting estate all helps the plight of these birds and encourages good breeding populations of all three. 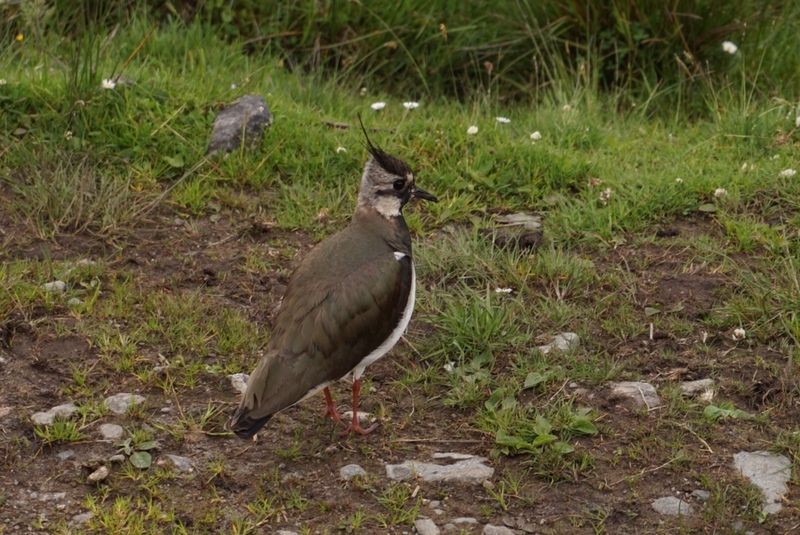 All migrants, they come to inland areas like Glenlivet to breed and the first to arrive are the lapwings which is a sure sign for us residents that spring is on the horizon. With their characteristic ‘peezie’ call, swooping flight and distinct head crest they are easily identified. The oystercatchers are close behind and their distinctive call, ‘cleep, cleep’ resonates around our farm from late February onwards. My favourite however is the Curlew, a beautiful mottled brown colour with long curving beak they are the biggest of the three species and have the most wonderful call that sounds like their name. Like our reindeer they frequent the higher ground, heather moorland where they circle endlessly seeking out a good place to nest and chasing away predators once they have laid eggs. It’s late June now, the eggs have hatched and some of the chicks are as good as fledged. Indeed today when I went up onto the hill to gather the reindeer a half-grown curlew rose from the ground to the frantic call of its parents, I suspect flying for the first time. Now the longest day is past these chicks, like reindeer calves, need to grow quickly and be ready for the winter ahead. The Oystercatchers, Lapwings and Curlew will all leave us for the winter, many of them going out to coastal habitats and river estuaries until next spring when they will return to breed again. Like these birds our life with the reindeer is ruled by the changing seasons, calving in spring, growing during the summer, rutting in the autumn and surviving in the winter. It is just amazing how quickly the days flash by, it just seems like yesterday that it was the New Year and now we are past the longest day. If I was a pessimist I would say its downhill from now on, but I’m not and I enjoy the changing seasons and look forward to what the next one brings. All you eagle-eyed social media geniuses would have noticed the anouncement that we are now on Instagram! Instagram is another social media site that is mainly based around photographs. We haven’t got too many photos up yet but hopefully we will get lots more up over the coming months. Our instagram name is @cairngormreindeer, so get following and feel free to tag us in your photos with our beautiful animals. We may even re-post some of the best ones! 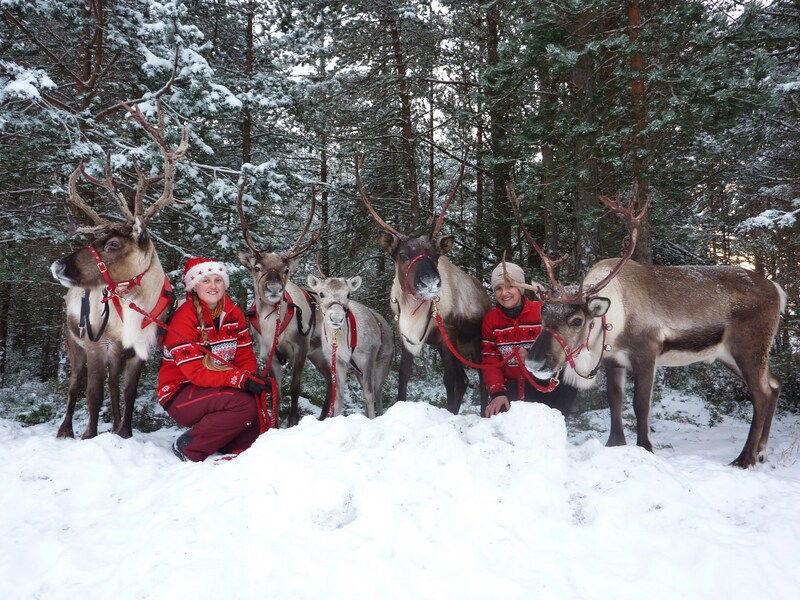 You can use the hashtag #crcreindeerselfie to see our reindeer selfies and please join in if you have any fun selfies with our reindeer, from our hill trips or our Christmas events. 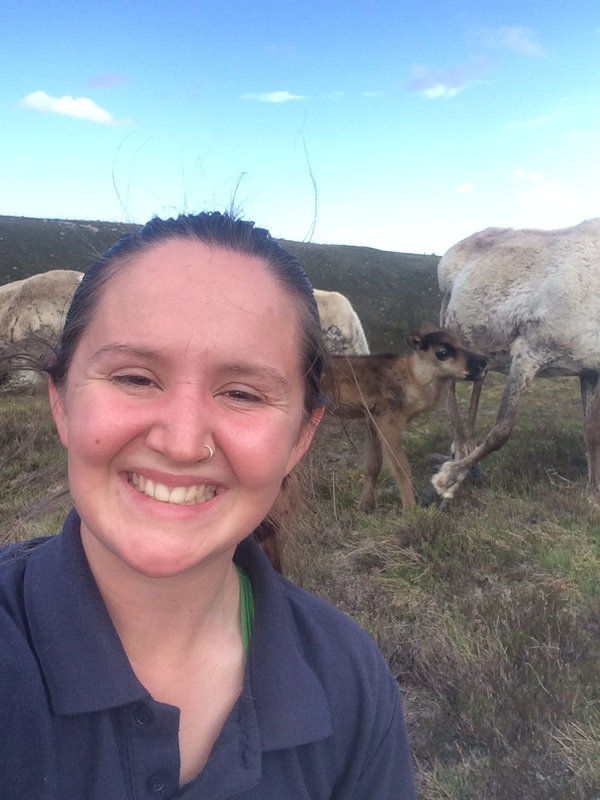 We hope you enjoy seeing a bit more of the day to day of reindeer herding through our instagram account, but for now here’s a wee selfie to start us off! 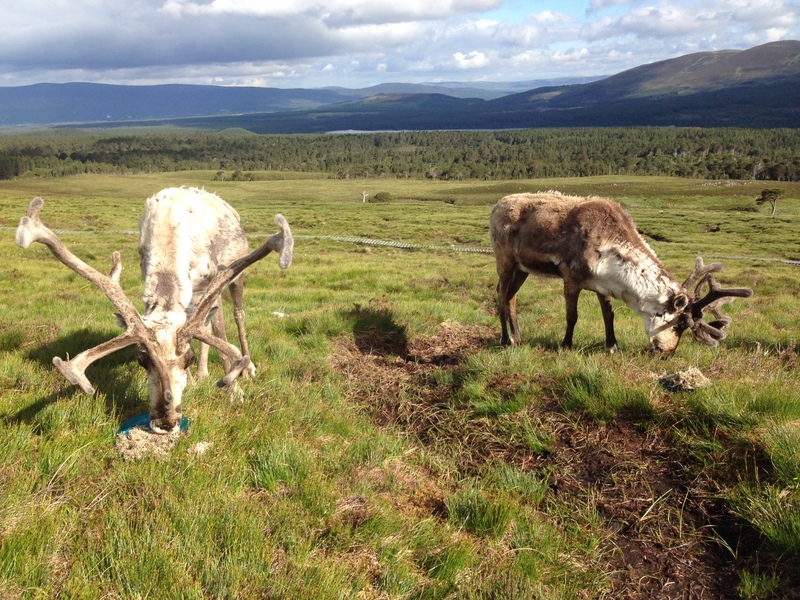 So this blog is a wee bit different, of course there’ll be a wee bit of reindeer chat – what’s a reindeer blog without the reindeer! However, this week we thought we’d plug some of the fab things going on in the Cairngorms next weekend for the Cairngorms Nature Festival – if you’re around get involved as there’s a plethora (a good word I know!) of ace things on offer to see and do for all ages! Every May, the National Park has a weekend to celebrate all the amazing nature things in the area, and this year it will be running on Saturday 14th and Sunday 15th May. It’s a super way of seeing and learning a wee bit more about the environment here and what makes it special, be it if you’re local or on holiday, get out there and learn something cool! I guess we should get on to the reindeer bit… we’ll be business as usual with hill trips going twice a day at 11am and 2.30pm as well as the paddocks & exhibition being open and all tickets prices will have a 20% discount applied. 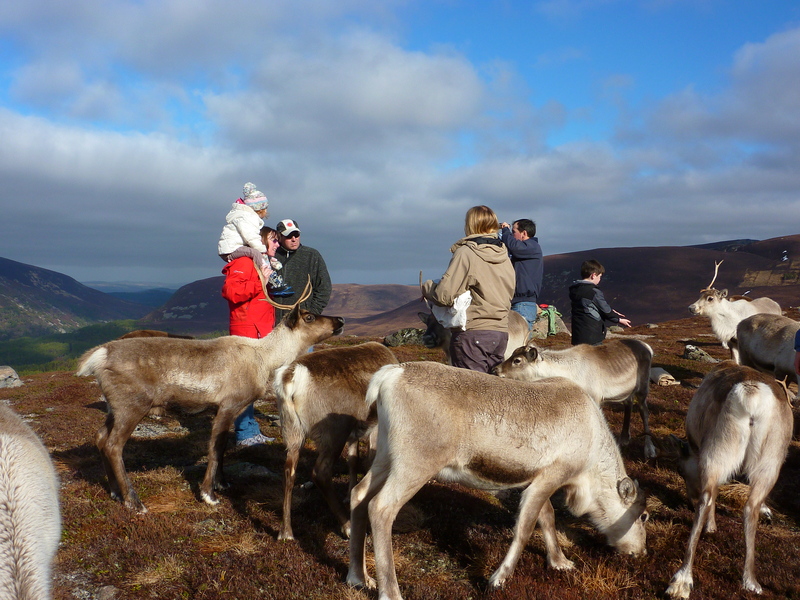 Come and feed the reindeer up on the hill, but be prepared for all weathers! Hopefully the sun will be shining when you come to visit us! There’ll also be tonnes of other things happening all over Badenoch and Strathspey, around Blair Atholl, Upper Deeside and Tomintoul. Some events that adults might enjoy include Green Woodworking Demos with Wooden Tom (he’s a really cool chap) at Feshiebridge Sculpture Trail on Saturday 14th. This is a ‘drop in anytime’ session running from 10am until 4pm (Here’s a handy link to his website). There is also the ‘Night Time on Nethy’ event on Saturday at 9pm. You’ll be on the river Nethy at night with the ranger, and booking is essential for that event. If you’d like to go on an all-day adventure, why not book into the ‘High Living in the Cairngorms’ event. This is a walk, starting at the Glenmore visitor centre and will involve some uphill. Booking is advisable and you will need to be dressed to be outside all day, in all weathers, and make sure you have a packed lunch too. For families, there are lots of interesting things to do. You can help the Loch Garten forest elves and fairies, by helping to create a garden for their enchanted tree. This event takes place on Saturday 14th, from 10.30am until 3.30pm (drop in any time) and you will also make some little forest-folk to take home at the end as well! This is located just 5 minutes from the Osprey Centre, and you can ask for directions from the kiosk there. On Sunday the 15th, there’s a self-guided trail letting us know all about how trees grow. It starts from the Glenmore Visitor Centre and you can do it any time between 10am and 4pm. At Blair Atholl there’s a ‘Woolly Woods and Woolly Nature Trail’ on both Saturday and Sunday. You can drop in at any time and search for the knitted nature and other wildlife from the Blair Atholl Information Centre. There are lots of other events going on all over the place, and you can get more information and book spaces by going to the Cairngorms Nature Festival page, where you can download a .pdf of all the events running throughout the weekend. Hope you all enjoy some of the events being put on! We’re lucky to see some pretty awesome wildlife whilst looking after the reindeer on the mountains, but its less usual to see wildlife in our back porch. 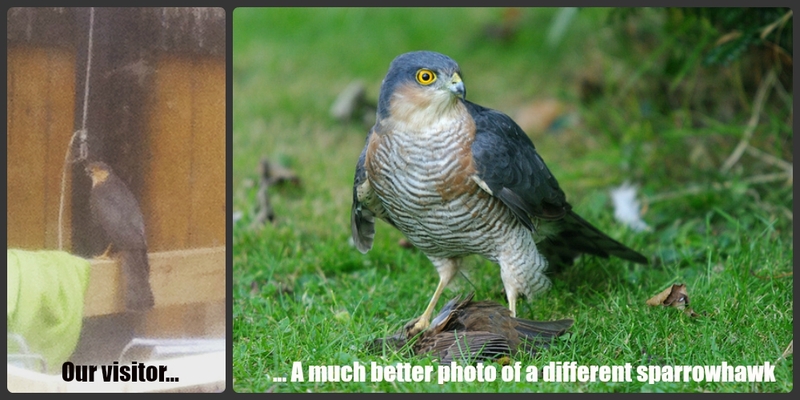 We were taken by surprise last week when we glanced out the back door and saw a rather worked up male sparrowhawk, who had somehow flown in then lost the door out… thankfully we were able to sneak past and open up the door for him to “escape”. We were pretty delighted to see a sparrowhawk close up, as the normal view of them is them dashing over at top speed, and even happier to see him fly safely away!